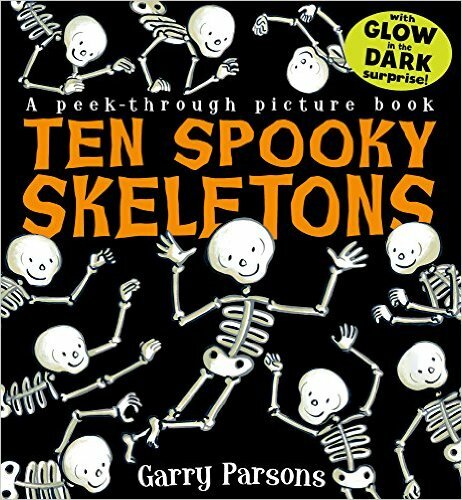 Join the skeletons as they go on a counting adventure in search of friends in the peek-through picture book from Garry Parsons, the illustrator of The Dinosaur That Pooped… series. Die-cut holes feature on each page to develop and continue the counting story and a glow in the dark cover, as well as surprise glow in the dark finale at the end of the story, adds a special touch to this spooky tale that children will love! Published in time for Halloween, this book is packed full of smiley skeletons. It's a variation on a traditional counting book, and counts up from one to ten as the skeletons search for their friends. There are holes in every page which reveal a fragment of the next illustration, and this adds some extra fun. The numbers are written as words in the text but they're written as numbers, too, and these are hidden somewhere on each page. My only criticism is that the rhythm of the rhymes doesn't quite work in places. This makes it hard to read aloud because you have to fit in extra syllables that shouldn't be there. I'm not sure that children will notice this, but for me it spoils what is otherwise a good book.